Following are indoor farmers markets operating in Eastern Iowa during the 2018-2019 winter season. Check with the venue for changes in case of inclement weather or other updates. 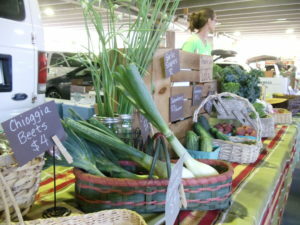 — Freight House Farmers’ Market, 421 W. River Drive, Davenport; 8 a.m. to 1 p.m. Saturdays and 10 a.m. to 2 p.m. Sundays. — Mount Vernon: First Street Community Center, 221 First St. E; 10 a.m. to noon Saturdays, November through April. No market on Nov. 24 or Dec. 29. — NewBo City Market: 1100 Third St. SE, Cedar Rapids. Regular business hours: 10 a.m. to 8 p.m. Thursday and Friday; 10 a.m. to 6 p.m. Saturday; 10 a.m. to 4 p.m. Sunday. — Urbana: Community Room below City Hall, 102 Capitol Ave.; 9 to 11 a.m. on the second Saturday of every month, November through April. — Waverly: Vineyard Church, 319 W. Bremer Ave.; 8:30-11:30 a.m. Saturdays Nov. 10; Dec. 15; Jan. 19 and Feb. 16. — West Branch: Town Hall, 205 E. Main St.; 10 a.m. to noon, first Saturday of the month, November through May, plus Dec. 8. No market in January. — Winneshiek County: Danan Lansing Memorial Building at the Winneshiek County Fairgrounds; 8:30 a.m. to noon Nov. 3 and 10 and Dec. 1 and 15. Following are outdoor farmers markets operating in Eastern Iowa during 2018. Bookmark this page for updates throughout the growing season. — Waukon, 3:30-6 p.m. Mondays, June 4 through Sept. 24, Allamakee County Fairgrounds; Extension Office, (563) 568-6345. — Harpers Ferry, 5-7 p.m. Fridays, May 4 through Oct. 12, St. Ann-St. Joseph church parking lot; Steve and Bobbie Cunningham (563)-586-3447. — Belle Plaine, 4:30-6:30 p.m. Fridays; June 1 through Oct. 26, 12th Street and Ninth Avenue, in front of the museum; Erica Dickerson, (319) 361-6623. — Urbana, 9-11 a.m. Saturdays, May 26 through Sept. 29, American Legion Pavilion, 204 W. Wood St., and Community Center on Saturdays in October; Eileen Schmidt, (319) 443-5620. — Vinton, 5-7 p.m. Thursdays, June 7 through Sept. 27, Vinton Railroad Depot, 612 Second Ave.; Brad Barker, (319) 472-4164. — Cedar Falls, 8:30 a.m. to noon Saturdays, May 5 through Oct. 27, Overman Park at Third and Clay Street; Joe Tyler, (319) 243-8981. — Cedar Valley, 3:30 to 6 p.m. Tuesdays, May 8 through Oct. 30, Kimball Avenue and Ridgeway Road, behind cancer treatment center and KFC, Waterloo; Mark Litteaur, (319) 296-1840. — College Hill, 4-6 p.m. Thursdays, June 7 through Oct. 25, 2205 College St., Cedar Falls; Jodie Huegerich, (319) 273-7883. — Evansdale, 3-6 p.m. Wednesdays, May 2 through Oct. 31, 3524 Lafayette Rd. ; Kelly Moore, (319) 830-1392. — Kimball Ridge Family Market, 8 a.m. to noon Saturdays, May 5 through Oct. 27, NE corner of Kimball and Ridgeway Avenue, Waterloo; Carolyn Adolphs, (319) 478-8624. — La Porte City, 4-6 p.m. Fridays, June 22 through Aug. 31, 200 block of Main Street; Barb Bader (319) 342-3369. — Waterloo Urban, 8 a.m. to noon Saturdays, May 5 through Oct. 27, Riverloop Expo Plaza, 327 W. Third St.; Waterloo Main Street, (319) 291-2038. — Independence, 8 a.m. to noon Saturdays, May 12 through Oct. 13, Wapsipinicon Mill, 100 First St. W; Buchanan County Extension, (319) 334-7161. — Mechanicsville, 4-6 p.m. Tuesdays, May 29 through Sept. 25, across from fire station on Main Street; Linda Coppess, (563) 432-7756, or Evelyn Walshire (563) 432-6983. — West Branch, 3:30-6 p.m. Tuesdays, May 15 through Oct. 9, by gazebo at Downey and Main streets; Marilyn Hanson (319) 643-2044. — Edgewood, 2-5 p.m. Fridays, May 25 through Sept. 28, rotate between City Park and Uptown on N. Washington Street; (563) 928-7036. — Guttenberg, 8 a.m. to noon, Saturdays, May 19 through October, 400 block of S. River Park Drive; Development and Tourism Office, (563) 252-2323. — Marquette, 4-7 p.m. Fridays, May 25 through Oct. 12, Driftless Area Wetlands Centre, 509 US Hwy. 18; (563) 873-3537. — Strawberry Point, 4-6 p.m. Wednesdays; May 30 through Sept. 26, Inger Park; Virginia Keppler, (563) 880-5069. — Manchester, 8-11 a.m. Saturdays, May 26 through Oct. 6, behind Bushel & A Peck on River Street; Jan Conrad, (563) 927-4141. — Dubuque, 7 a.m. to noon Saturdays, May 5 through Oct. 27, Iowa Street near City Hall; Dubuque Main Street, (563) 588-4400. — Dyersville, 2-5:30 p.m. Thursdays, May 24 through Oct. 4, Commercial Club Park, Hwy. 136; Chamber of Commerce, (563) 875-2311. — Elgin, 4:30-6 p.m. Thursdays, May 17 through Oct. 11, City Park; Deanna Walvatne, (319) 269-2614. — Oelwein, 3-6 p.m. Mondays and 8-11 a.m. Fridays, June 1 through Oct. 26, Log Cabin Park, 100 First Street W.; Delphine Deaner, (319) 283-8012. — Solon, 3-6 p.m. Tuesdays, June 5 through Oct. 9, also 8 a.m. to noon Sunday, May 27, Mushroom Park/Town Square; Theresa Grieder, (319) 310-4671 or (319) 848-3074. — Anamosa, 3-6 p.m. Wednesdays and 7 a.m. to noon Saturdays, May through October, Scott and Main Street; Judith Phillips, (319) 462-2971. — Monticello, 3-5:30 p.m. Wednesdays and 8-11 a.m. Saturdays, May 12 through Oct. 13, Willow Shelter on East Oak Street next to Pizza Ranch; Peg Mere, (319) 480-6739. — Center Point, 4-6 p.m. Wednesdays, June 6 through Sept. 26, Titan Machinery parking lot, 4250 Grain Lane; City Hall, (319) 849-1508. — Central City, 4-6 p.m. Thursdays, June 7 through Sept. 27, Courtyard Park, S. Fifth Street; Main Street Office, (319) 438-1761. — Ely, 9 a.m. to noon Saturdays and 4-6:30 p.m. Wednesdays, May 5 through Sept. 29, in front of tennis courts on Rowley Street; Theresa Grieder, (319) 310-4671 or (319) 848-3074. — Mount Vernon, 4:30-6:30 p.m. Thursdays, May 3 through Sept. 27, next to the First Street Community Center, 221 First St. E.; Rick and Trude Elliot, (319) 558-9202. — West Liberty, 4-7 p.m. Wednesdays, June 13 through October 24, downtown at Spencer Street; We Lead economic development, (319) 627-4045. — Grinnell, 3-6 p.m. Thursdays and 10 a.m. to noon Saturdays, May 10 through Oct. 20, Central Park, Broad Street and Fourth Avenue; Grinnell Chamber, (641) 236-6555. — Dysart, 4-6 p.m. Tuesdays, June 5 through Sept. 25, Uptown on Main Street; Rhonda Lassen, (319) 476-2138. — Bonaparte, 3-6 p.m. Thursdays, May 4 through Oct. 26, Bonaparte Mercantile, 703 First St.; (641) 451-5294. — Washington, 5-7:30 p.m. Thursdays, May 17 through Oct. 18, Downtown Central Park, Washington Street and Iowa Avenue; Bob Shepherd, (319) 458-9396.